Scottie Nell Hughes, an occasional news pundit for Fox News and Fox Business host, Charles Payne were involved in a three-year affair. Both Hughes and Payne are married. Payne has been suspended by Fox due to allegations that he sexually harassed Hughes. He admits to the affair but denies that Hughes was coerced in any way, calling it ‘an ugly lie’. 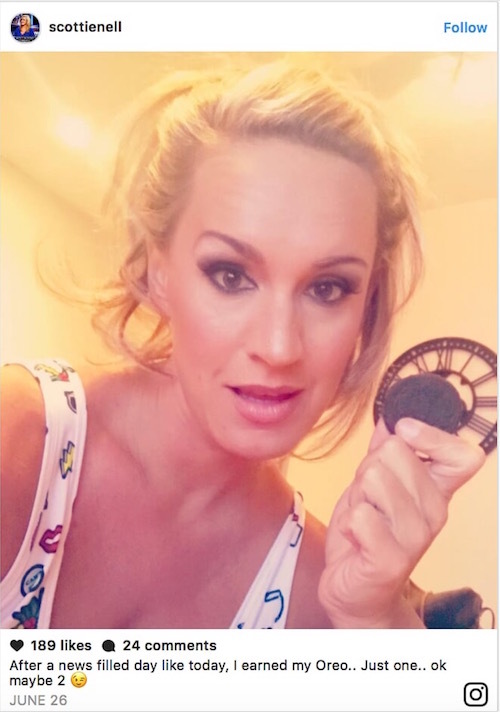 Earned an oreo? Let’s have a look and see if she’s earned anything more than the public’s contempt. Amid the latest Fox News sexual harassment scandal, emails have emerged that seem to vindicate Payne on the charges of sexual harassment, at least. They are from Hughes to Payne and are pretty graphic. Red Alert Politics that published images of the emails, spoke to Kristina Lee Hall that worked with Hughes at the Tea Party Network. Hall claims that Hughes has been known to sleep with men that might advance her career. ‘I shared a room with her, she thought that the (the Tea Party leader) could get her places, and this is the first time I really spent one-on-one time with her. She was all over (the Tea Party leader). She wanted to go to his hotel room to get ready for the conference because we had been out on Bourbon Street and stuff like that. I had to physically leave the room, the hotel room, because they were under the covers in his bed pretty much getting ready to full getting it on. I was uncomfortable and left, she came back to our shared hotel room at two or three in the morning, hair completely disheveled. This looks like a pattern of behavior for Hughes, doesn’t it? Even if there was coercion, her past actions are casting that in considerable doubt. Payne admitted to the affair on Wednesday but is fighting back the allegations that there was coercion or threats. The affair was no secret, with the pair boldly sharing a hotel room in May 2015 in Las Vegas on a company trip to The Money Show in Las Vegas. Hughes also attended Payne’s birthday party at his home in 2015. The behavior of the couple made Payne’s wife uncomfortable and she spoke to now ousted Fox News President of Programming, Bill Shine about it. Shine then barred Hughes from appearing on Fox News or Fox Business. The disgruntled Hughes reported the affair to the law firm representing Fox News and is now claiming that the ‘blackballing’ is because she was coerced into the relationship and alleged threats of reprisals. She also told her lawyers that she stayed in the relationship because she thought it would help her land a permanent gig at Fox News. And this is why character matters. Because one day, who you are in public and who you are in private will be revealed. Just ask Anthony Weiner about that. 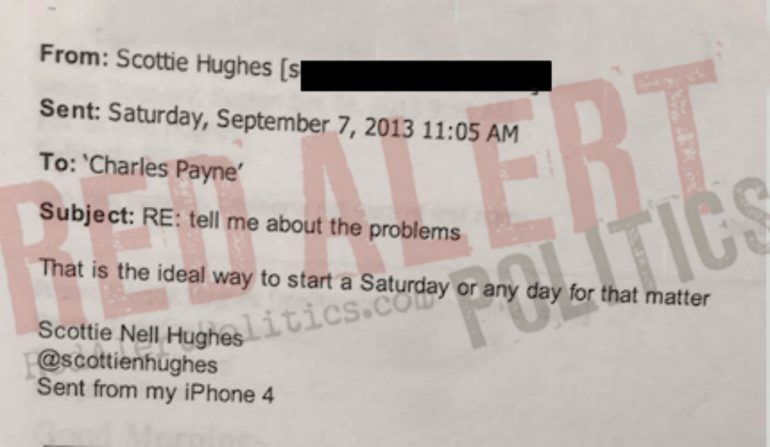 Share if these emails cast a whole lot of doubt on Hughes’s claims.